This adorable birds I love my Daddy bib is a wonderful gift idea. A lovely gift idea for a newborn, Fathers day or any other occasion. The design is cute because it features a Father bird and a baby bird. A brown Father bird and a green baby bird appear to be interacting with each other. There is a blue heart on each bird and underneath the bird there is blue text that says 'I Love My Daddy'. The bib is designed to fit any infant ages from newborn to 36 months. It features blue accents so it makes a perfect gift for a baby boy. It is safe for baby because the ink used to print the bib is non toxic. The bib is easy to clean because it is machine washable and dryer safe. You will be able to use it over and over again. You can add your own message to the front or the back of the bib before ordering. This is a wonderful idea if you are giving as a gift because it makes it extra special. If this is a gift for a new baby you could add a congratulations message or the child's name and date of birth. 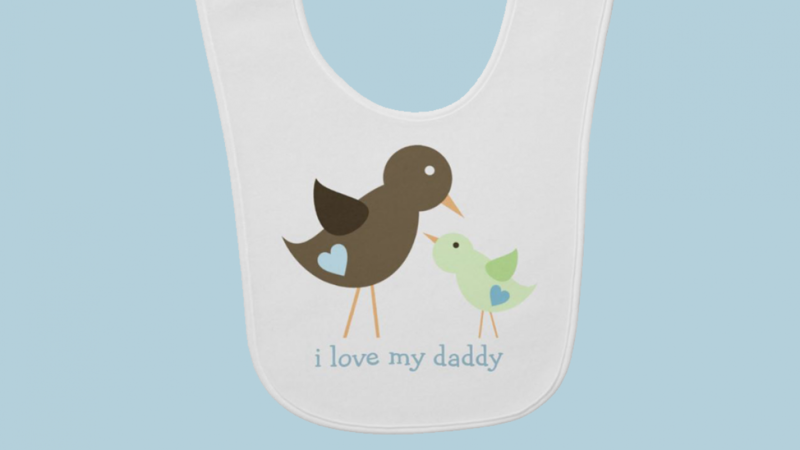 If you like this cute custom bib you might also like to check out the following cute items.